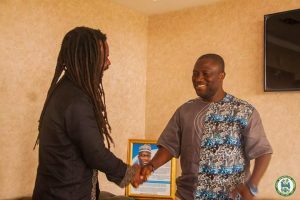 International afro roots music star and environmental activist, Rocky Dawuni, has paid a courtesy call on the Mayor of Accra , Mohammed Adjei Sowah, to discuss ways to help keep Accra clean. The Grammy-nominated singer and songwriter, was appointed the Regional UN Goodwill Ambassador for Africa last year to generate support and publicity amongst his audience for UN Environment’s messages. Mr. Dawuni who was welcomed into the New City Hall informed the Mayor of his passion for environmental issues and pledged his support to improve the level of sanitation in Accra. He announced plans to launch a tree planting initiative in the city and called for support from the Assembly. “I would want to collaborate with the Assembly to launch a tree planting initiative in Accra because I want to get more individuals on board to plant and care for the trees. This is something I will lead and encourage people to do,” he said. He also informed the Mayor of an upcoming environmental conference likely to be held in Accra. Mayor Sowah who welcomed Mr. Dawuni noted that issues about the environment and sanitation have been prioritised in the city adding this informed the Assembly’s decision to join the Breathelife campaign. “We are very much concern about our environment and the air we breathe, that is why the Breathelife campaign is very important because the air that we breathe is highly contaminated by all kinds of particles including smoke and dust particles,” he said. He congratulated Mr. Dawuni for his new role and pledged the Assembly’s commitment to support his initiatives. Touching on sanitation the Mayor said the assembly was collaborating with plastic recycling companies and organisations to step up a plant to ensure that waste plastics were cleaned before recycling. He pointed out that the Assembly had initiated a waste segregation programme in basic and secondary schools in the metropolis as part of efforts to inculcate the habit of separating the waste at source.